Oh to go back to Gardening Harvesting Season! It snowed today, like 4 inches. Uhg. I like the snow is Nov & Dec, but it’s almost March and we had a taste of some really good Springtime weather. It was just nature teasing us! So, as I was looking back on my pictures, I found this picture of a meal I made for a date night. 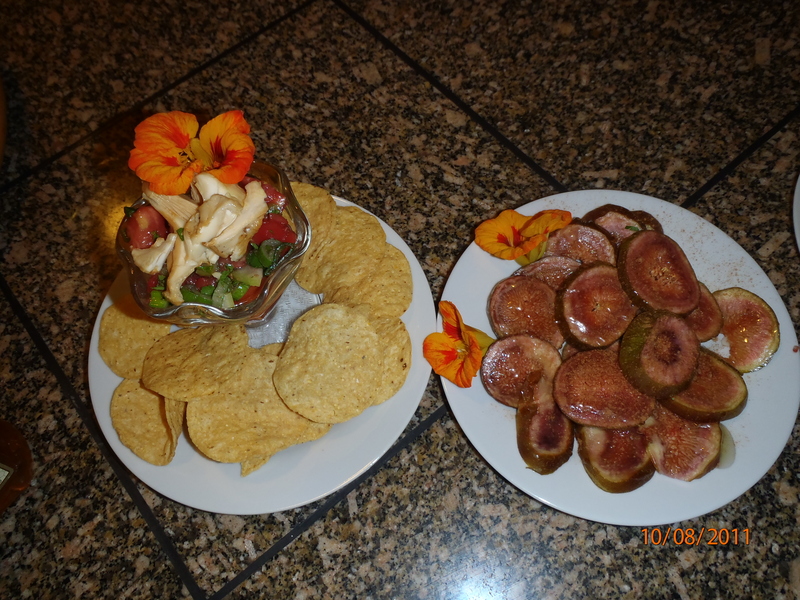 It was chantrelle (wild mushroom) ceviche and fresh figs. This fall we harvested more chantrelles than you could imagine. I have them dried for soups and also frozen. I just sauteed them in olive oil with garlic and onions, they are great in soups or pizzas or whatever! Isn’t it soooo pretty. Here is the recipe, it comes from Living Raw Food (a great Raw Food recipe book). I didn’t use yuzu juice, I added nasturtium and also used tomatoes and garlic. Transfer the mixture to a bowl and whisk in the olive oil, scallions, and pepper. To prepare the chanterelle mushrooms, first cut off the coarse end of the stem. Then cut the mushrooms into halves or quarters, depending upon the size. Place the cut mushrooms into a bowl of cold water and massage with your hands to remove dirt. Remove the mushrooms from the water and lay them out on paper towels. Pat the mushrooms dry. Pour the marinade over the mushrooms and let them sit at least 1/2 hour. Set aside. Puree the pineapple in a blender until it becomes a smooth liquid. Add the sea salt and avocados and continue blending until very smooth. Set aside. Place all the ingredients in a bowl and toss until evenly mixed. Set up 8 martini glasses. Place 2 to 3 tablespoons pineapple-avocado puree in the bottom of each glass. 3 to 4 tablespoons heirloom-tomato salsa, then about 1/4 cup marinated mushrooms. Repeat once or twice, as needed. Garnish with the parsley sprigs and celery heart stalks. This entry was posted in Food For The Good Life, Simple Living and tagged chantrelle ceviche, chantrelle mushrooms, foraging for food, good life food, Raw Food. Bookmark the permalink.